We live in uncertain times. The looming sovereign debt crisis (mainly in the UK and the US). The prospect of more common, more severe weather incidents due to climate change. The looming threat of energy scarcity due to a contraction in oil supplies, and an antiquated, poorly maintained energy grid. In short, Mark Twain hadn't seen anything yet. John Michael Greer, in a much older post, wrote about the difficulty of planning the road ahead, in the face of such uncertainty. He addressed the futility of the Transition Town movement, because it was preparing for such a specific outcome, when there was no likelihood, much less guarantee that the problem they were envisioning a solution for would ever come to pass - at least in the way they imagined it. Originally, this post was going to be about what jobs/skill sets will be needed in a post-"choose your long emergency" society. Upon further reflection, though, the answer is: Nobody knows. The one question I see posted again and again in the peak oil/climate change blogosphere (most of whose writers have now embraced sovereign debt default as some kind of unholy trifecta) is: What do I do? How do I prepare? By this, people usually mean, "What should I buy?" i.e., should I stockpile ammo and canned goods, or buy a generator, or even a wood stove? The answers are all fairly universal. Forget about stockpiling. Get out of debt. Learn to grow your own veggies. Have alternate ways of heating your very well insulated home. Learn a skill that will be desirable/useful to your neighbors, or people who may have more cash than you. All of these ideas, though, are predicated on someone having some sort of vision as to what the future looks like - some kind of accurate prediction. "Prediction is hard," Yogi Berra once said. "Especially about the future." So are all of those bad steps to take? No and yes. No, because anything you do to prepare for an uncertain future is bound to give you a sense of security, and comfort that you are doing everything you can. But yes, they may be bad if you think that they are guaranteed to 'save' you, from whatever you feel you need saving from. We have a good idea of what needs to be done to strengthen our community, reduce our reliance upon fossil fuels, increase our food security, and reduce our individual debt loads and carbon footprints. The problem is, will it help if the problem is not a gasoline shortage, but an ice storm? Or if the problem is not a bizarre weather incident, but a sudden spike in interest rates caused by a hair trigger printing press? The bad news is, nobody knows. The good news is, it probably can't hurt. So what is the one thing you can do to help yourself, your family, and your community to be 'resilient?' Cultivate a 'do it yourself/let's just give it a go' mentality. If you're a mid-level marketing manager with a major firm, and that's all you're good at, I'd start learning a few more practical skills, ASAP. Not just because those skills will be useful, but learning how to learn those skills will be crucial. If you can cultivate the attitude of not being afraid to try/fail, and a baker's dozen useful skills with your hands along the way, you'll be miles ahead of the person next to you on the GO train who has spent the past three years following up to the minute news on Hollywood break-ups and hook-ups. Most importantly, you need to learn to be comfortable with uncertainty. You need to be okay with not knowing what's coming next, but be able to trust that your knowledge, skills and instincts will get you through whatever life throws at you, and safely out the other side. The best, indeed the only, way to do that is to set about learning new skills now. Anything that interests you, from knitting and textile work to how to keep slugs from devouring your tomatoes. The skills you learn are not as important as the hard work you do learning how to learn. But with great knowledge comes great responsibility, to paraphrase my favorite comic book uncle, and when your Brangelina-obsessed neighbours knock on your door in the middle of whatever situation has had the power out for four days, invite them in. Make them a snack, and help them to make the adjustments that the online community helped you make when you started journeying down the road. The Ant and the Grasshopper is not only a cautionary tale - it's also a really crappy way to treat the neighbors you may so desperately need one day. Cultivate a 'do it yourself/let's just give it a go' mentality. Kids will take a chance. If they don't know, they'll have a go. They're not frightened of being wrong. Now, I'm not saying being wrong is the same as being creative, but if you're not prepared to be wrong, you'll never come up with anything original. By the time they get to be adults, most kids have lost that capacity. Seriously, if you haven't seen this talk, take the time and watch it now. If there's one thing I've learned from years of research into this topic, it's that very little of what we need is all that difficult once you wrap your head around it. You may be stuck ordering a few key parts off the internet, or getting something particularly sophisticated done professionally, but most of what a human being needs is pretty easy to meet with goods that are abundant and cheap or free. Honestly, if you want to stock up for peak oil, you're far better off collecting buckets, scrap wood, dirt or tools - not shotguns and canned beans. What I have that's more important than anything else is a stack of old textbooks, readers digest DIY guides and other basic knowledge. I've learned how to carve wood with a knife, reshape plastic in an oven and change the cut of a pair of jeans. Not glamorous, but someone's going to have to do this stuff, and every skill that every person learns puts us all ahead. I really must ask, how do these articles on Peak Oil and Nuclear downfall really pertain to Hamilton specifically? Yes, they are items of concern for all Canadians, and they are somewhat interesting but do they really belong here? I just find this articles of this nature somewhat discredit the integrity of the site, as while I may agree with many of the points put forward, the frequency of these articles makes the website seem to give the site a more conspiratorial, national/global tone which just seems to me as undermining a website that seems fundamentally meant to be devoted to local Hamiltonian concerns. I don't know, I think they are a nice change from talking about the Stadium. Think Aeropocalypse. Nothing like spending hundreds of millions of dollars based on a an assumption of cheap fuel when it's reasonably certain that cheap fuel won't be here for much longer. it's reasonably certain that cheap fuel won't be here for much longer. Over a buck a liter for gas says it's already gone. Consider a recent article in the NY Times, which is based on an IEA Report which now suggests that Peak Oil may be officially behind us. I'd say that these articles are timely, important and have you ahead of the curve. Thank you RTH!! Thanks for linking this report, JonD (and thanks for the kind words). Edit: I've moved the rest of this comment into a blog entry. Ironically, the most interesting and relevant post has the lowest comment score. OK I'll bite, which comment do you think is the most interesting and relevant? 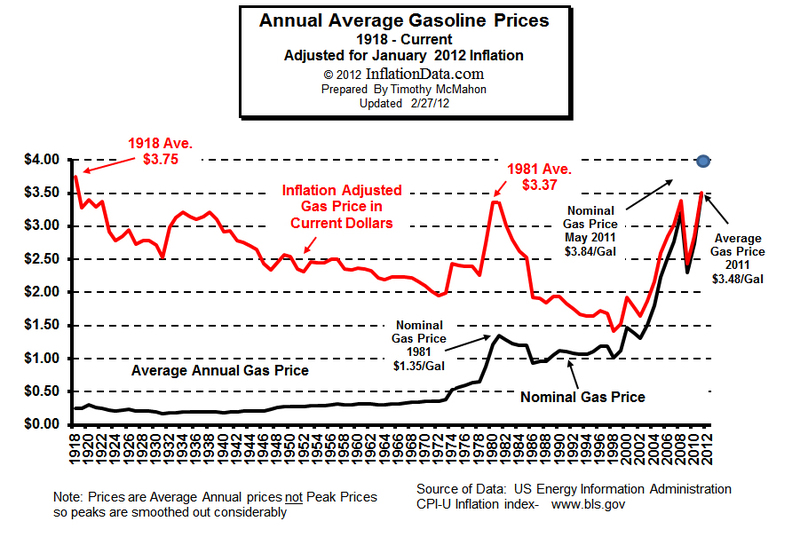 The one that links to a graph displaying inflation adjusted gas prices. You mean the one that says inflation adjusted gas prices have been going up steadily for the past decade thus disproving the commenters point? [R]eal oil prices fell steadily throughout the 20th century even as oil production rates grew by about 2% a year (the 1970s were an aberration, caused by political embargoes). Oil prices didn't start increasing in real terms until well into this decade, when total production began approaching the peak production rate predicted in most global hubbert curves. This graph reflects a global oil industry that had no problem growing production by 2 percent a year for nearly a century while reducing real prices, but can't increase the daily production rate beyond around 84 mbpd without triggering steep price increases due to marginal cost. It also reflects an oil-dependent economy that crashes when the oil price spikes beyond around $140 per barrel. As nobrainer notes, that's the opposite of what the person who posted the link has argued. One thing we should remember about gas prices right now is the 8% added by HST in July. This factor seems to be forgotten now that oil has crept up a bit of late. Despite all of the moaning and complaining on this site and everywhere else in North America we have the lowest gas prices in the world. In Europe for example gas is running twice what ours is. Not only that but the other costs of vehicle ownership is also much higher. License plates are more expensive and are tied to the size of the engine, or the horsepower. What I find most telling about all this is that car ownership is steadily rising in Europe. Their cars may be smaller and more fuel efficient than the average here but despite the higher costs more and more people are deciding to spend so much on private transportation. They have a less need of a car with better transit and typically shorter commutes and denser cities and yet car ownership is steadily rising. I bet gas will go a lot higher before it makes a significant impact on ownership rates here in North America. The problem with Turbo's graph is that it shows gasoline prices, not oil. Gasoline prices reflect a whole host of other factors, and rarely show more than a moderate correlation with crude oil prices. Ask anyone who's worked at a gas station - all their gas is purchased weeks in advance. The day-to-day price fluctuations are as much a game as anything else. If such an inflation-adjusted graph were to show crude oil prices over time, this is what it would show. Notice how well it lines up with everything we've been trying to say? A gradual curve upward over the last 64 years, with big jumps around the American peak (late 70s, as well as the oil embargoes), Soviet Peak (late 80s) and now with the global peak. Despite the huge drop in 2008 (a clear result of the highest prices ever), the line starts shooting upward again, at nearly the same rate, within a year. And if you check the current prices, it's gone even higher since the graph was made. Good timely article Jason, with a nice can do ring. I'll stay away from the peak oil/price debate other than to note once again, its not the oil so much as the dollar, at least in the next year or two. I think your advice to get out of debt to be the most aspect but note that you are speaking of individuals. What about the collective - Hamilton, Ontario, Canada? Do we ignore those? Therefore, I believe your list should include attempting to become involved either politically, or in raising awareness (ie, your blog - nice job), or in the Spectator's case, lowering mis-awareness! As our grandmothers said - A stitch in time saves nine. Seems our impotent democracy would rather wait till nine stitches are needed.